We moved into our house during the summer of 2013. The trees the run behind the house were in full bloom and the housing area behind us couldn’t be seen. Once the leaves began to fall, we noticed something that appeared to be caught in one of the trees. It is too high up to reach with a ladder so it has remained there. On windy days, the object flaps about, and I often think it will finally break free, but it doesn’t and it hasn’t in all of the time that has passed. Not even when Hurricane Sandy went through our area or the many nor’easters that we’ve had since then. I have no idea what the item is. At first, I thought it was a plastic shopping bag someone carelessly discarded that was caught by the wind and deposited in the tree, becoming tangled among the branches. It catches our attention only to be forgotten until the next windy day when it is spotted again. I would think a plastic bag would have degraded by now. Or maybe I hope that it would have. Each year as winter turns to spring, the leaves on the trees come out to block our view and we can no longer see it. When fall arrives, and the leaves are gone, we are almost surprised to see that it is still there. This year it looks different. It appears more tattered and looks like it might actually be a fabric of some sort. 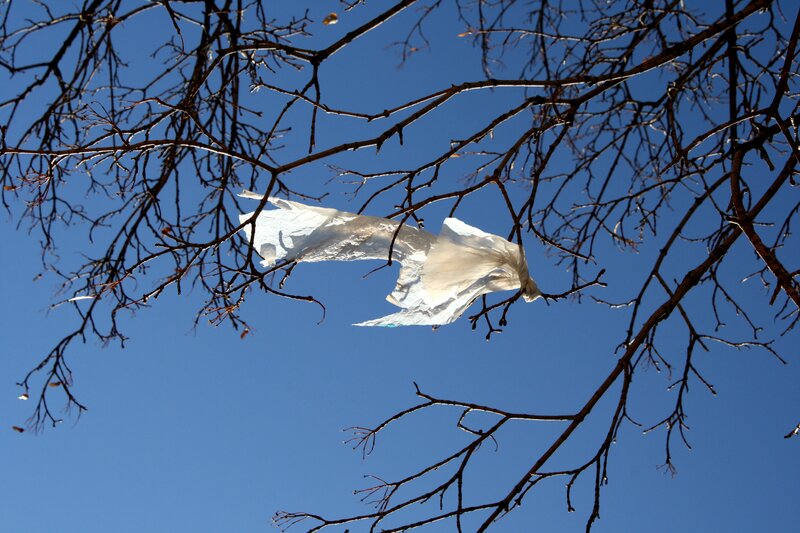 Fabric is heavier than a plastic bag, so I wonder how it might have gotten so high up in the tree. I wonder if it will still be there next fall when the leaves have gone again or will it finally break free. And if it does, where might it go next? Is there anything outside your window that makes you pause and wonder? With fall officially set to depart on Thursday this week, I have to say that fall this year has truly been one of the more beautiful ones that I can remember. Maybe it was due to the fact that we had a rather mild summer. Oh sure, we had a short period of time when the temperatures were in the 90’s, but for the most part, the summer stayed in the 80’s and when fall came, it actually was cool. That might have had something to do with the amazing show that Mother Nature put on in our region. Driving to work, the bright oranges and reds of the trees with the early morning sky showing pink and orange in the background made for a beautiful drive. And all those wonderful colors on display made for a lot of weekend road trips for my husband and myself. We did a lot of leaf peeping in the region, making several trips to Pennsylvania, including a fall foliage train ride and a tour of covered bridges. We also visited the Great Falls National Park on both the Maryland and Virginia side and discovered a tasty little barbecue place along the way. Can I just say that Mookie’s BBQ in Great Falls, VA serves the most amazing loaded fries, which comes complete with burnt ends, pulled pork, cheddar cheese and onions? Yum! They are worth a stop if you are in the area. Now that the days are getting shorter, I am back to driving to work in the dark. Some mornings are darker than others, depending on the cloud cover. Although I only travel 6 miles from my house to my job, most of the roads I take are two lane with limited lighting. Driving in the dark means having to watch out for the various animals that are trying to get back home before dawn. It also means having to watch out for the deer that always seem to want to cross in front of my car. Note to the deer…stay where you are. It really isn’t better on the other side of the road. If watching out for deer isn’t enough, we have to add the morning exerciser into the mix. While I salute those who actually have the energy to get out of bed and go for a walk or jog, doing so in all dark clothing is not a good idea. Why? Because we can’t see you! There are all sorts of fluorescent exercise clothing and shoes that have reflective things on them, so why can’t people actually wear them? They sell them for a reason. Companies don’t want you to get hit by a vehicle when you are out exercising. But if you aren’t going to wear some bright neon shoes that light up with every step you take, could you maybe wear one of those lights that blink on and off? A light can be seen by someone in a car. If the light is too expensive, can you slap on some glow in the dark duck tape? I don’t care where you put it, but maybe a strip along your arm and leg that faces the street or wrap some around your running shoes….in other words, somewhere a driver can see it. That will help drivers and other exercising people see you and hopefully not run into you. Safety first!!! Labor Day, also known as the unofficial end to summer has arrived and now begins the push into fall. The weather has actually been very fall like during the past week or so with temperatures mostly in the 70’s and even dropping into the 50’s at night. Of course it is supposed to get back into the 80’s today, so we will get a reminder that summer is still around. The last two days were also rainy as Maryland was visited by Harvey as the former hurricane exited the U.S. Next on the horizon is figuring out the path Hurricane Irma will take as it gets closer. For those of us along the Atlantic coast, we hope that the path stays well south and avoids the U.S. altogether. But, in case things don’t work out that way, and the path brings it up the eastern coast, we will get ready the best we can. You can tell that the seasons are starting to change as the trees are beginning to thin out their leaves. Before long we will be able to see the homes behind us again. It is nice during the summer when you only see the green of the trees. Or in the case of our Japanese Maple, a beautiful red wine color. The cooler weather also caused some of the leaves to change from vibrant green to lighter green with yellow tones. So it won’t be long before we start seeing the oranges and reds as nature puts on its fall show. We have started planning short day trips around the area now that the weather is more comfortable. We booked a fall foliage train ride in Pennsylvania in mid-October and are planning a longer trip in early November. We are taking a covered bridge driving tour and another that will tour barns, some which are hundreds of years old. I hope to get plenty of pictures. We recently returned from our trip to the Poconos, specifically the area around Jim Thorpe, Pennsylvania. The trip up was very pretty. I was surprised by how much further along the trees in Pennsylvania are in terms of turning colors for autumn than we are here in Maryland. We ran into a little glitch during the planning phase. The place that we originally planned to stay notified us about a month out that they had made an error in booking and we would only be able to stay one night with them and would have to move somewhere else. They seemed surprised when I asked for a refund and declined to stay one night with them. I informed them that I didn’t want to move somewhere else so I would not be staying with them at all. They finally agreed to a full refund and I went to our second choice, which was a Victorian Bed and Breakfast in the main historic area downtown. We planned to arrive early enough to catch one of the train rides that would take us into the mountains to view the fall foliage. As we drove into town, we saw that there was a picnic area by the train station, so we decided to take our snacks and have a light lunch before the train ride. While my husband purchased the tickets, I went to scout out a spot for lunch. And immediately discovered that the area was swarming with bees. Not just a few, but hundreds of bees. They were everywhere. Even in the shade, which is rare as bees tend to like sunshine and not shade, but it didn’t matter to them. As for me, I am someone who if bitten, swells up a lot. Like major swelling. So I hurried back to my husband, who was noticing the bees around the ticket window as well. Lunch was eaten back in our car and we waited to board the train until they blew the five-minute warning whistle. The ride into the mountains was very pretty. I left most of the picture-taking to my husband as he is taller and can hold the camera higher. We saw several roads that led to some of the areas around the mountain, so we decided to go back the next morning to check out some of the old tunnels that had been used to haul coal back in the 1800’s. After the train ride, we had some time before we could check into the B & B, so we drove out to find the monument to Jim Thorpe, which was in the other area of town. Upon checking into the B & B, we were told to just go up to our room on the third floor and the owner would be up in a few minutes to go show us where everything was. Our room was the only one on the floor and we had a small terrace that had a nice view of the mountains. After a brief meeting with the owner, she gave us our keys and said that she would bring up our breakfast baked goods before she left for the day. After unpacking a few things, my husband and I decided to go explore the downtown area. There is a street that runs behind the building that we were staying with little shops and restaurants dotted among the houses. The surprising thing was that many of the shops were already closed for the day. Checking the hours, most were open from 11-4. We poked around those that were still open. My husband was looking for a little gift for his co-worker that would be picking up most of his work while he was gone. He didn’t find anything for her, but we did find a set of slate coasters that were made in Pennsylvania and were rather cute. We ended up back at the B & B and sat on the front porch for a while as we tried to decide where to go for dinner. We had passed several places, so we pulled out our phones and searched for recommendations. We ended up going to a little Asian restaurant down the street and it ended up being very good. The next day we left after breakfast and found the roads that we had seen the day before from the train. We explored the tunnels and enjoyed the mist floating down from the mountain. We also explored the surrounding area in our search for the covered bridges that I had read about when researching the trip. We found both of them. One is still in use today and the other is located in a State Park. We planned on lunch at Roadies Restaurant and Bar, which is located at Penn’s Peak, which is a concert venue. The food was typical bar food, but was really good. It was the view that was the main feature. We ate lunch while bopping to music from the 80’s and relaxing with the view. If you are in the area, even if you just get to the parking lot, stop and take a look. You won’t be disappointed. We made it back into town in time to tour a couple of the museums and shops. Before dinner we decided to take advantage of the little terrace outside our room, catch up on the news and read a little. After just a few minutes we started to hear a loud buzzing. Looking up we realized that it was a drone. Someone thought it would be a good idea to buzz the street. It kept going back and forth and was rather annoying so after flipping it off, we went back inside. After dinner, we found a shop that we knew would have the perfect gift for our son, the House of Jerky. We had a really nice time getting away and spending time together. There were some WTF moments, so I will write about those next time. Have you ever had one of those moments when you just had to laugh? My husband and I had one of those moments this weekend. We both wear glasses. I’ve worn glasses since I was 10 years old, had bifocals at 29 and was told by my optometrist two years ago that I was starting to develop glaucoma. My husband did not need glasses until several years ago and then it was only for reading. That changed last year when he was told he should wear them all the time. He has resisted that and I often remind him that he is supposed to have his glasses on. He usually replies the optometrist told him he should wear them all the time, not that he had to. Both of us have started having problems with colors such as trying to figure out if dress pants, both his and mine, are black or dark navy or taupe or olive. My husband has always had problems distinguishing colors. After his time in the military, where he wore a uniform every day in varying shades of green and khaki, he left it to me when it came to selecting his suits, dress shirts and ties. He will give me his opinion, but he has a problem determining if some of the colors actually go together. He doesn’t see the subtle differences in some of them. He usually pulls out several shirts and tells me which pants he wants to wear and I select the one that goes with it. He will occasionally choose a tie and if it doesn’t go, I will quietly switch it out and he goes on about his day. Lately, it has gotten harder for even me to distinguish between the colors. I take the pants to the bathroom and look at them under the light, which is a brighter LED, and I hope I have the black plants instead of the blue. I hand them off to him to select the shirt and tie. But it has gotten harder and we have even taken to labeling the item’s tag with the color. Needless to say I have gotten concerned that my eyesight may be getting worse. My husband began searching the internet and found an article about how the type of light you have in your closet can actually make your clothes look different colors. He explained, in great detail mind you, that the type of bulb (ours had a yellow hue) could actually cause the problem with telling the difference between colors. He said we should change the bulb and if that didn’t work, we might have to change out the globe because it could also make it hard to distinguish colors. So this weekend we changed out the lightbulb in the closet. And I could tell the difference between black and navy blue pants. Success! And then we laughed because it was such a simple fix and we couldn’t help but think how long we had struggled. That had us wondering if we ever went off to work with mismatched colors. If we did, I’m sure the lighting would have made it look fine. Hmmm, okay, that’s what I hoped happened. If not, it will be something to laugh over. After growing up in the Midwest and living in the South for 11 years, the one thing I missed the most was not being able to see the leaves change in the fall. There was a saying that there were two seasons in the South, summer and February. For the most part, that pretty much held true. It was always warm and humid and then during February, the weather seemed to go through the three remaining seasons, rainy for spring, cooler for fall and really cold (or at least in the 40’s) for winter. When we moved to the Mid-Atlantic three years ago, I was looking forward to seeing the beauty that is fall. So I was rather disappointed when the past two years fall has seemed to arrive late and leave in a few weeks. The leaves never really turned colors. The just seemed to turn yellow and then fall to the ground. Hmm, not what I was expecting. At least not until this year. Maybe it has something to do with El Nino, but our summer was rather mild when compared to other summers. We had a few days with the temperature in the 90’s, but for the most part, we stayed in the 80’s. We also has more rain that we usually received. So when the calendar said that it was fall, the temperatures actually seemed to agree. And because of that, Mother Nature has put on an amazing show. The leaves have been turning all sorts of colors and they have lasted for weeks. I can’t remember the last time I saw so many different shades of orange and red. It has been beautiful. It has also meant that my husband and I have been able to take our weekend drives where we just enjoy the fall show. Some of the roads, especially those in the state parks, are beautiful to ride through. Today we realized that the area around us has finally peaked. There are less trees to view and many more are almost completely bare now. So thank you Mother Nature for providing us with such a spectacular view of fall.